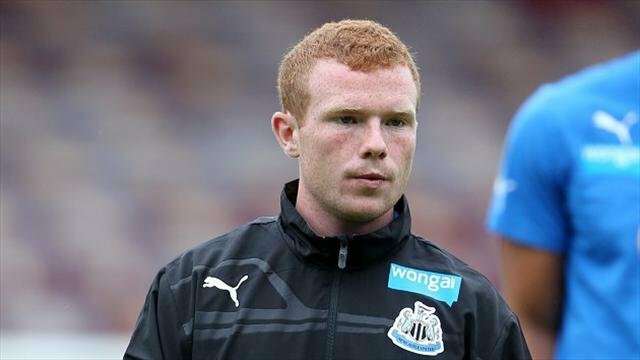 Newcastle United youngster Adam Campbell must have known that his days were numbered with his local side, after making only three appearances in the 2012/2013 season and then spending the subsequent years out on loan. Despite a short, but decent, spell for Gateshead in the Conference, Campbell is now aged 20 and it was inevitable that the Premier League club was faced with a decision as to what to do with him. The decent thing would have been to have called him into the manager's office, had a quiet chat and said, "It's not us son, it's you. You're not Newcastle class and that's saying something considering some of the joker's we currently have on the payroll." John Carver would have then given Campbell a nice warm hug, a £20 voucher for Marks and Spencers, a set of Newcastle Brown Ale beer coasters, and then sent him on his way. But instead they went either the cowardly, inept or just plain stupid route and announced his release over Twitter. In a world where people breakup on Facebook by simply changing their relationship status to "it's complicated" and then the brutal finality of "single", I guess this was bound to happen one day. In total, the club released five players on Saturday, including cancer survivor Jonas Gutierrez who presumably received more courteous treatment from the club. Campbell's girlfriend was certainly not happy with the club's treatment of a player who had been with the St. James Park outfit since he was seven years old, blasting the club with the following tweet: "Adam has never been told this officially, nice to find out through Twitter. #disrespect". Hashtag disrespect indeed, it was pretty shameful stuff from Newcastle. Hopefully Campbell lands at another club this summer.